Organize your week by themes. This method will organize your day to maximize your effectiveness. It will help you get more done and feel less stress. 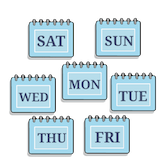 Batch your work with recurring themes for different days of the week. Make a plan in your calendar right now, and commit to following it.